Few home owners fully understand their homeowner’s insurance. The policies are written in dense legalese…and many ­policyholders don’t even try to wade through them. As a result, many people are mistaken about their rights when dealing with insurers and are unaware of gaps in their coverage, some of which could cause financial ruin. Myth: If my home is destroyed, my insurance will pay what it costs to rebuild. Prior to Hurricane Andrew, which devastated parts of coastal Florida in 1992, most policies provided “guaranteed replacement cost coverage” that financed reconstruction whatever it cost. But this guarantee is no longer included in the vast majority of policies. These days, most policies cover only up to the dollar figure specifically listed as the coverage amount or occasionally a bit more. Example: State Farm policies typically cover up to 20% above this amount. Even home owners who are aware of this change tend to assume that they are safe as long as the coverage amount listed in their policy is in line with the typical cost of rebuilding a home such as theirs. Unfortunately, because of a ­phenomenon called “demand surge,” that might not be sufficient if your home is destroyed in a major disaster. When many homes in an area require repairs, the cost of building supplies and labor tend to ­skyrocket—sometimes by more than 50%. Insurers also have been eliminating “building code coverage” from ­policies. When a home is more than 50% ­destroyed, it must be rebuilt according to current building codes, not the codes that were in effect when that home was originally constructed. Without building code coverage, a policy will not pay any added costs involved with upgrading to stricter codes. What to do: Ask your insurer whether it offers a “demand surge” rider, especially if your home is in an area where hurricanes or wildfires are common—these are the disasters that most often cause sharp spikes in building costs. Ask at your town office whether any building code changes have taken effect since your home was built that would make it much pricier to rebuild the home today. If so, ask your insurer if it offers a code coverage rider. Myth: Home owners must hire a contractor willing to do repairs for the amount the insurer says it will cover. Your insurer says a repair can be done for a certain amount, but the contractor you want to use says it will cost more. Policyholders often assume that their only option is to work with the ­low-cost contractor recommended by the ­insurer…or to hire a lawyer and take the insurer to court, an expensive and uncertain proposition that most people prefer to avoid. However, it sometimes is possible to convince an insurer to pay the amount a contractor wants without resorting to lawyers. What to do: Contact your insurer’s claims department. Explain that your contractor is quoting a higher figure, and ask to have this amount covered. If the insurer refuses, ask to speak to a claims department manager and repeat the request. If the answer still is no, call your contractor and ask if he/she can contact your insurer on your behalf. ­Veteran contractors often have experience negotiating with insurers. Meanwhile, keep careful notes whenever you speak to your insurer’s adjuster, other insurance company employees, your contractor and anyone else involved. If your contractor cannot work things out for you, mail a letter to the claims department manager explaining unemotionally why you don’t believe you are being treated fairly. Include a detailed record of what you believe to be missteps by the insurer, such as dramatically underestimating the cost of specific building supplies or even times the adjuster missed appointments. Insurance executives often back down when they receive letters showing that the policyholder is too savvy to be pushed around. 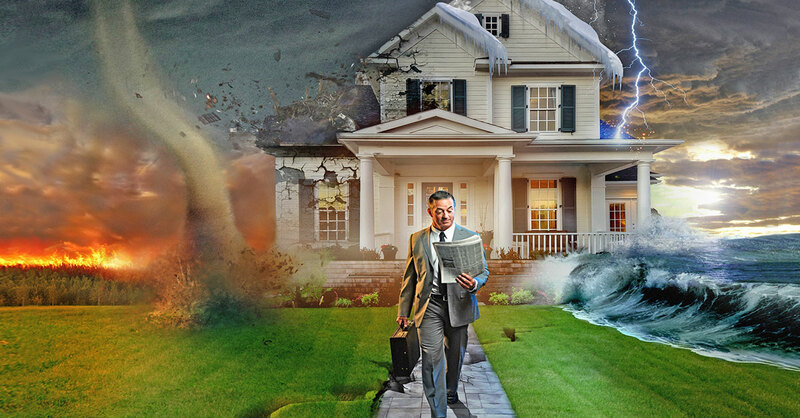 Myth: Homeowner’s insurance protects against losses from most types of disaster except for floods and earthquakes. Home owners who live in or near flood zones or earthquake-prone areas generally are aware that they are not financially protected against these types of disasters (unless they pay extra for flood insurance or an earthquake rider). And they may be aware that insurance doesn’t protect against such unlikely cataclysms as nuclear explosions or war. But many home owners are unaware that damage caused by other, more mundane types of disasters, such as mud slides, landslides, sinkholes and riots (germane to some urban areas), is excluded as well. What to do: Many insurers offer sinkhole, landslide/mud slide and riot ­riders for an added charge, generally well under $1 per $100 of coverage. Myth: My homeowner’s insurance will pay the bills if someone is injured on my property. Not always—there are some big gaps in the liability component of homeowner’s insurance. Your policy does not cover injuries to members of your household, for example. Policies generally do not cover injuries to people who visit your property for business purposes, either. And policies increasingly exclude injuries related to trampolines, tree houses and zip lines—some insurers won’t cover home ­owners who have these things at all. Other potential backyard hazards including swimming pools, hot tubs and climbing structures generally are covered—if they are disclosed to the insurance company and higher premiums are paid. If you intend to rent out your home, contact your insurer to ask if your liability protection extends to paying guests. If not, you could rent out the property through a service such as Airbnb that provides liability protection to property owners…or purchase coverage specifically for rental properties from a company such as CBIZ or Peers Marketplace. Myth: Since I never bothered to make a record of my possessions, now that I’ve had a fire there’s no way for me to get compensated for all of the things I lost. It certainly is wise to document your possessions before you ever suffer a fire (or burglary or flood or other disaster). It is much less likely that you will obtain the full amount you are entitled to for your lost property if you cannot remember everything you lost…or you cannot prove what you lost to the insurance company, opening the door for it to question your claims. The easiest way to document your possessions is to simply walk through every room of your home with a digital camera, or even a smartphone, and record video. But all is not necessarily lost if you neglected to do this before suffering a big loss. What to do: If you have extensive damage to your home, go through the digital snapshots and videos you have taken in your home and uploaded to social-media accounts, shared with family members or backed up to the cloud. Ask family and friends who have come to your house for parties to forward to you any pictures or videos they took.